With Captain America: Civil War right around the corner and LEGO Group with a license to produce Marvel sets, it seemed inevitable. And lo and behold, we get three fantastic sets to tide us over until the movie gets released. Of these three sets, the ‘Super Hero Airport Battle’ is the largest and, naturally, the most expensive. With a price tag of £69.99/$79.99 and a piece count of 807 it means you’re paying roughly 8-9p/9-10cents per piece, which isn’t too bad when you look at it that way. This set is also quite unique in that it contains the spoilerific Giant Man brick built figure. 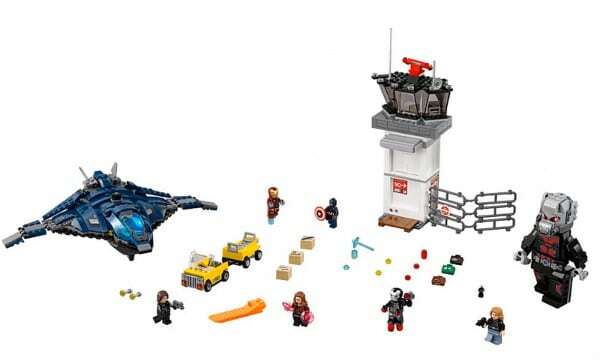 Also in the set is the airport control tower, a baggage car and a smaller version of the Quinjet. Minifigures are the real draw, although we’ve seen most of these characters before, but the completist will want them in their updated costumes. Among the figures are Iron Man, War Machine, Scarlet Witch, Agent 13, Captain America, Winter Soldier, an Ant-Man micro-figure and of course the Giant-Man Brick built figure. These are all fantastic, and it’s the first outing for the Agent 13 figure. The printing on these figures is excellently detailed; in particular Iron Man and War Machine, who both get leg printing, are fantastic. I’m one-hundred percent sure, but Agent 13 has what looks like a new hairpiece that is really well sculpted. And this time around, Scarlet Witch gets correctly coloured hex blasts. If there is a slight downer on the mini,figure side of things, it’s Captain America. Sadly we’ve seen it all before and despite the new detailed printing on his torso, he just looks really plain when stood next to the others in this set. This brings us to the main reason most people will get this set. The Giant Man figure. What a revelation. Lego could’ve simply released him as one of their larger scale figs like The Hulk or Thanos. Instead they’ve really outdone themselves and designed a brick built figure that looks like a regular minifig grew really big. Huzzah! There are quite a few stickers to apply, but it’s so fun to build him and put him next to the others. On the negative, they could’ve done something to spruce up his back. From the front he’s almost perfect but you turn him around and you just see the bottom of his constituent parts. It’s a minor negative on an otherwise impressive feature, however. The rest of the model is pretty standard for a Marvel release. Most of the larger sets revolve around a vehicle and/or small structure. This one doesn’t disappoint in that respect. First up, you get the airport control tower. It’s fairly uninteresting, although they have added an exploding wall-play feature which kinda makes up for it. Otherwise, though, it’s simply a tower. In addition to that you get a small baggage car, which is pretty neat. In fairness, as cute as it is, it feels like an attempt to bump up the number of pieces. Lastly, the set comes with a Quinjet. This particular vehicle is considerably smaller than the previous two minifigure-scale Quinjets that Lego gave us last year and in 2012. That said, it’s a great model with some great features. The build itself is good fun, as it should be, and engaging enough to be interesting. The only thing that I started to find a little boring was the Airport Control Tower, but then its top redeemed it. Naturally, the best thing to build is the Giant Man figure. The techniques used to make it posable, like a regular Lego minifigure, were brilliantly thought out. I hope to see more like this, perhaps in a Galactus set, although I doubt that’ll ever happen. So to round this off, this set is well worth the money. It includes a great selection of minifigures, a vehicle and a structure. There’s not a lot else you could want from a Lego set.